If you've been following along regularly you'll know that I updated the pond this spring: emptied it, made it a bit smaller, refilled. 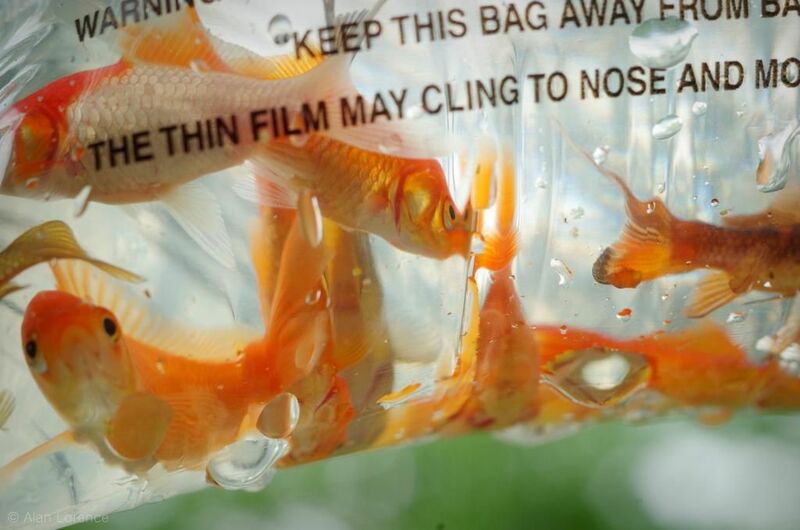 I've been waiting to add new goldfish, and the wait is finally over! A dozen small comets were purchased and introduced to their new home last week! 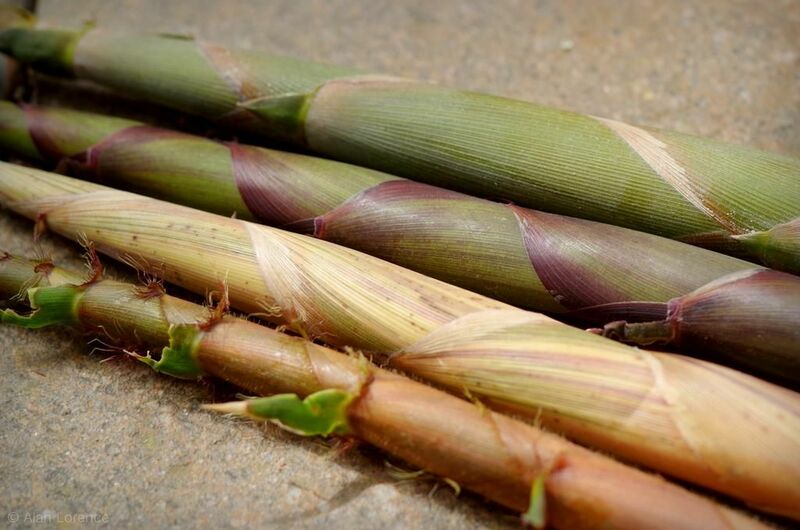 ...and there's nothing I love more in the garden than bamboo shooting season! 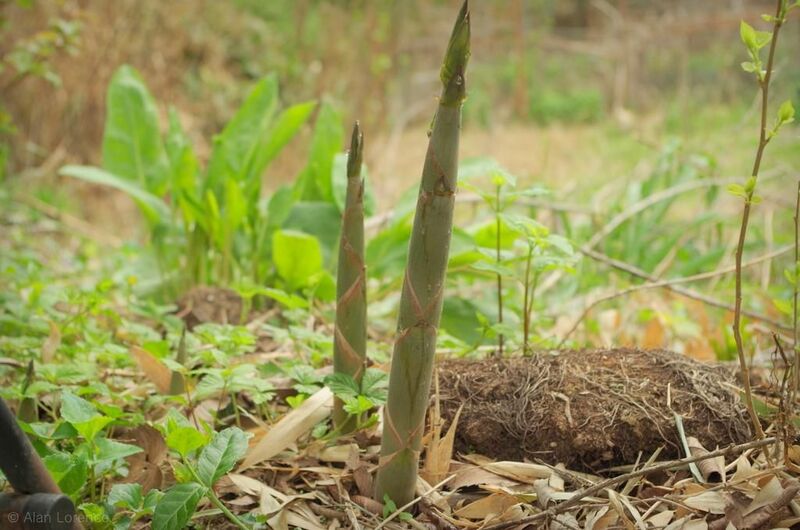 I've got four different Phyllostachys species shown here, all shooting at the same time. From bottom to top it's Ph. nigra, Ph. aureosulcata 'Aureocaulis', Ph. propinqua 'Beijing', and Ph. bissetii. 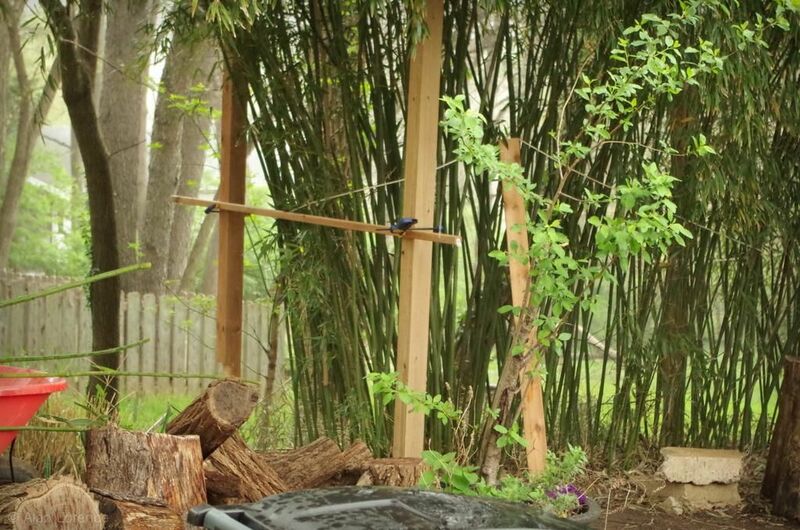 Continuing with my permanent bamboo support project. Yesterday I got started by thinning out the grove and then sinking a few wooden posts as the backbone of the structure. The next step was to add the front posts and the crossbeams. That sentence makes it sound so easy, but working with the leaning bamboo constantly straining against me made this a difficult task! 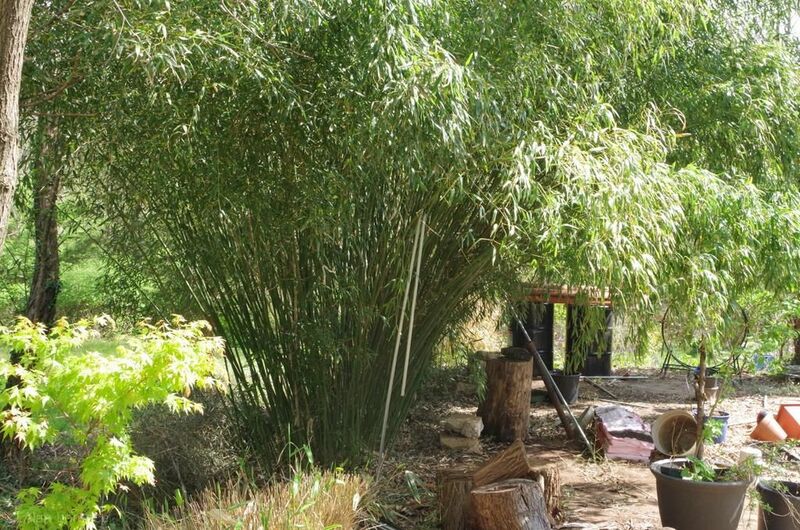 One of the first big bamboos I planted was Phyllostachys bissetii back in 2008. It's along the edge of the driveway in back but is also visible from the street. I've fought with it for several years, trying various methods to keep it more upright. Part of the problem is the overhanging trees -- they make this plant lean over the driveway in the quest for more sunlight. I have started on my final solution to this problem, so let's take a look at what I've done. ...always come up where they shouldn't? 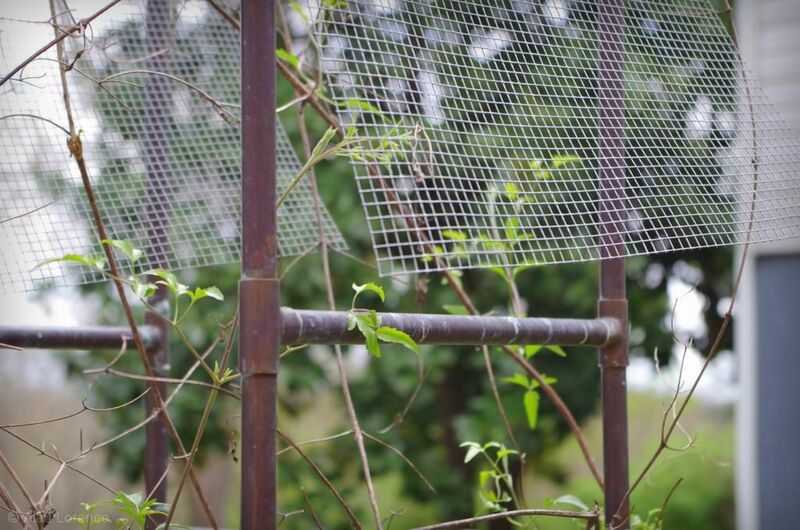 Remember the copper trellis that I revitalized a couple of years ago by adding the mesh panels? Well, the temporary connectors (plastic zip ties) have degraded in the sunlight and have started breaking. The result is curling panels and an overall shabby look. 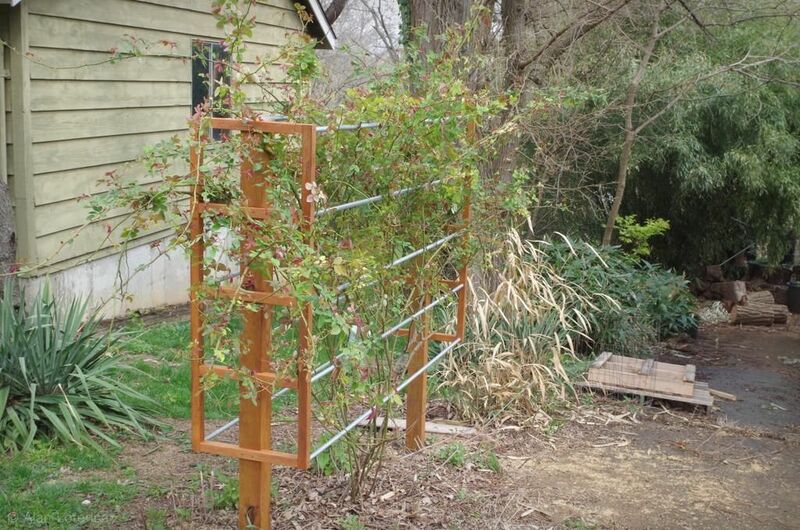 The rose support has been built (well, almost finished) so you've seen the final design. As I've said I really didn't have a good idea of what I wanted to do, so after I set the two posts I got to work on the computer. 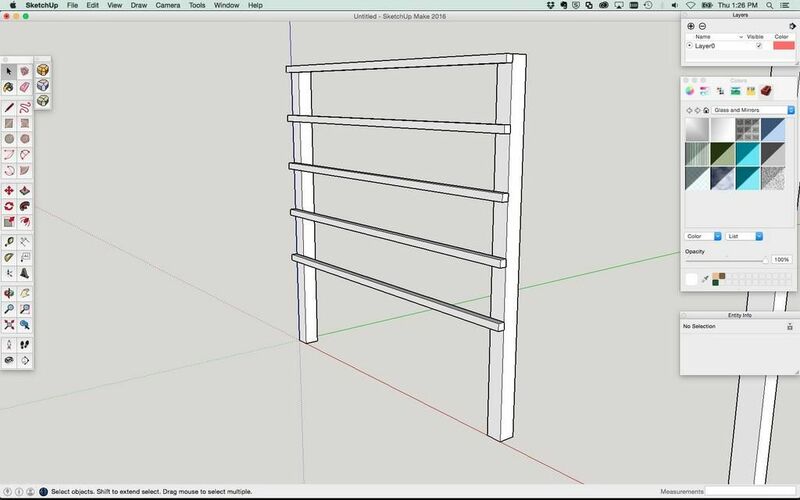 The first design was the simplest: just add some horizontal members to the vertical posts. This would give me something to tie the rose canes to, but almost immediately I knew this was not adequate. Sure it would be easy to build, but I knew I wouldn't be happy with having to tie many rose canes to it. Plus it wasn't really my style. 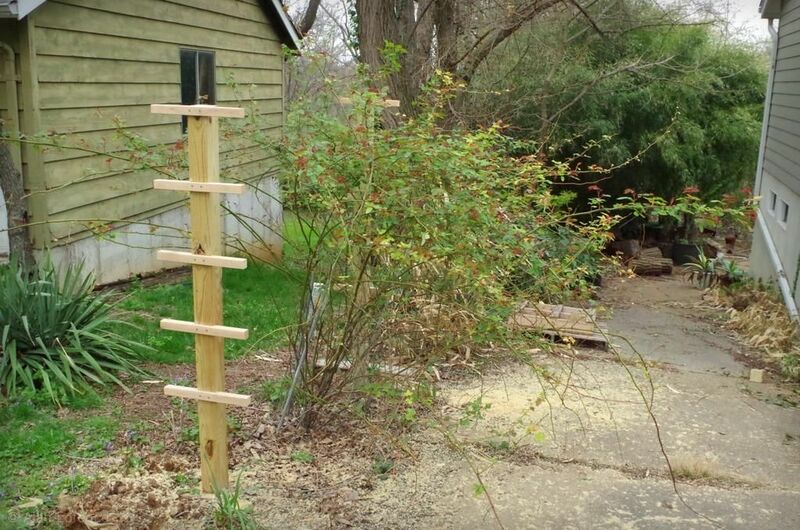 I started building the rose support last week, and if you remember I did not have a final design in mind yet -- I only knew that I needed two sturdy posts. Well, I finished the design on Friday and started building. I'll show you my design process tomorrow, but you can see that the first step in building it was to add some cross members to the posts.